My great-grandfather and grandaddy were the postmasters down in SW Virginia (the Post Office was in his house) and this card very much reminds me of the old postcards that they used to stock. This all started with a piece of the new RHR/Vanilla striped ribbon. I couldn't make it work, though and ended up with this card. You know when your card takes on a life of its' own and demands it's own layout and embellishments? Well, this is one of them! The postcard's "message" was made by masking a section of En Fraincais and using my Stamp-a-ma-jig to place it. 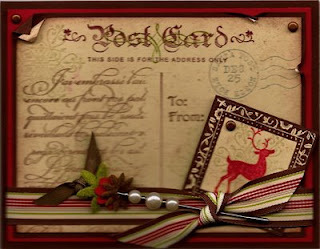 The curly embellishment over the "post card" is from Frames With a Flourish and stamped in Old Olive. I used the snowflake from Winter Post in stamped-off Sahara Sand. I distressed the edges by rolling the cs with my fingers and ripping it in places. I also sponged some Sahara Sand over the whole image in spots to add age. The hat pin is from the Pretties Kit.